Goals from Hannah MacLeod and Alex Danson gave England the perfect start to their Champions Trophy campaign with a 2-1 win over Argentina in Nottingham. The pair registered diving finishes either side of the break before Noel Barrionuevo's consolation as England stunned the defending champions. England, hosting the event for the first time, are one of the less-fancied sides in the six-team tournament. 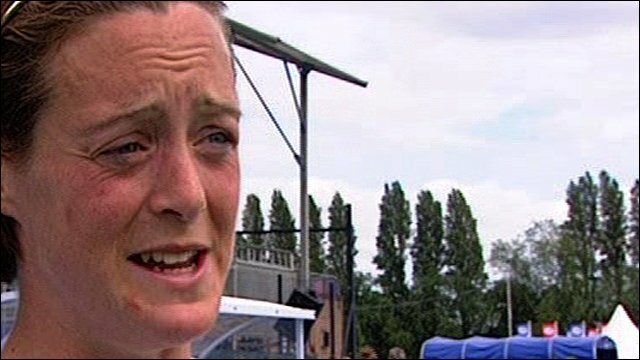 "You cannot overestimate this result," England's Crista Cullen told BBC Sport. "We beat the world number two team 2-1 in the opening game of the Champions Trophy, and it's brilliant for us to set out our stall in front of a home crowd. "Hopefully we can take this forward and continue in that vein." No English women's team has finished higher than fifth at a Champions Trophy - hockey's most important event behind the Olympic Games and World Cup - but this side are targeting a top-four finish. Argentina, by contrast, have won the last two Champions Trophies and beat England in each of their three previous meetings in the tournament. As expected, the host nation started the game under heavy pressure, Argentina forcing England goalkeeper Beth Storry into two strong saves, the second rebounding clear off her left post. But England did not look overwhelmed and took the lead only slightly against the run of play, as Leicester star MacLeod's diving touch proved enough to steer the ball into an empty net following an attack down the right. England lived dangerously at the back in the first half, Storry saving several times as her defenders gave up possession far too easily, while Laura Unsworth could have added a second at the other end but sliced wide. Argentine superstar Luciana Aymar tried to inspire her side to a second-half fightback, but her weaving runs went unmatched by her team-mates, even once England captain Kate Walsh had received a five-minute suspension for a tackle from behind. England have worked to improve their penalty corners and Danson's deflection with 15 minutes to go looked to have sealed the victory, though Barrionuevo hit back immediately to keep the hosts under pressure until the end. "It was really important for us to hit the ground running," added Cullen, a team-mate of MacLeod's at Leicester. "We knew it came down to work rate and I've never seen our girls work as hard and run as hard as we had to do there. "We have a deep belief that we're starting to engrain now, and that comes through winning in big tournaments like this." The win strengthens England's ambition to reach the top four in the Champions Trophy for the first time and, before the tie, performance director David Faulkner told BBC Sport he hoped the team could exceed that target. "We've got to be realistic, we're still two years out from the Olympic Games, but it's a good measurement for us," he said. "We have to manage expectations. Growth and development would be top four, but this group could stretch that a bit further." Last year, England finished bottom of the pile, losing five consecutive games after starting brightly with a 2-2 draw against the Netherlands. They go into 2010's event as the second lowest-ranked team at the tournament, currently placed seventh in the world (New Zealand are ranked ninth). This English team forms the overwhelming majority of the Great Britain side preparing for the 2012 Olympics in London. As in football, England, Scotland and Wales have separate national sides, but hockey is attempting to conquer the problem by running a British team alongside the home nations for an entire four-year Olympic cycle. The English players train as part of the Great Britain squad, but play matches for both England and GB throughout the year. Earlier on Saturday, Germany's Eileen Hoffmann struck with two deflections as her side defeated China 2-1 in the opening game of the tournament. World and Olympic champions the Netherlands, who play England on Sunday, beat New Zealand 3-1 in the day's final game. But New Zealand matched the Dutch for large periods and briefly held the lead, which will give confident England hope of causing a further upset.